With all the disgust and discussion, angst and acrimony, fear and frustration over, about and because of Lexington’s traffic, there is one thing we do NOT have: hope. The painful yet unacknowledged truth about vehicular congestion around and through Lexington is that it will never become substantially better. Innovative ways to fund intersection improvements like the Hospitality Tax or more state revenue via gasoline sales cannot – WILL not – be able to solve the overwhelming and worsening traffic problems. The greatest enemy of progress is geography or, maybe better stated, topography. Think of any stretch of road in the Town of Lexington or immediate areas. What can be done to widen those thoroughfares by a lane in each direction without plowing through neighborhoods, a strip mall, a church parking lot or a row of houses turned into lawyer’s offices? Lexington already has an eminent domain scandal. Besides, the acquisition cost for all the properties needed to make a difference would be astronomical. Other realities intrude on dreams of reduced transit times down Sunset Boulevard, Lake Drive, Highway 1 or Old Cherokee. Many waterways, be they creeks or streams are controlled by the Army Corps of Engineers. Approvals to ford, drain or alter them is extraordinarily difficult if not impossible. Even widening existing bridges would take years to be considered. Look, we can’t even maintain dirt dams on two acre ponds, why believe we can do anything about concrete and steel bridges for large volumes of vehicles? There are also aesthetic and environmental considerations that must be included in planning for new roadways, traffic circles, “fly overs.” or even right of ways (rights of way?) Sometimes, it’s just simple physics that preclude viable options. A “beltway” is out of the question because there is no where to run the belt. Lake Murray is a major impediment to a northwest passage. Dense development north to Irmo and east to West Columbia block routes from Columbia to Lexington and Lexington to Irmo/Harbison/Chapin or northeast to I-26. So, all that morning traffic flowing out of Lexington in the morning and back in the afternoon have no alternatives. Even if there were no physical restraints to construction, it still has to be paid for. Massive tax increases could not produce enough revenue to make a sizable difference. Lexington County and the state have many, many more priorities to accommodate, so funds from either (or both) will never, ever be available in adequate amounts or within a useful time frame. Don’t forget, this is just about improving traffic flow. There is also a great need to repair and resurface current streets and roads. The renovation of “Malfunction Junction” might provide limited relief when completed in ten or fifteen years, but by then, the population will have grown so much that even that will be outdated by the time it’s opened, if not before. 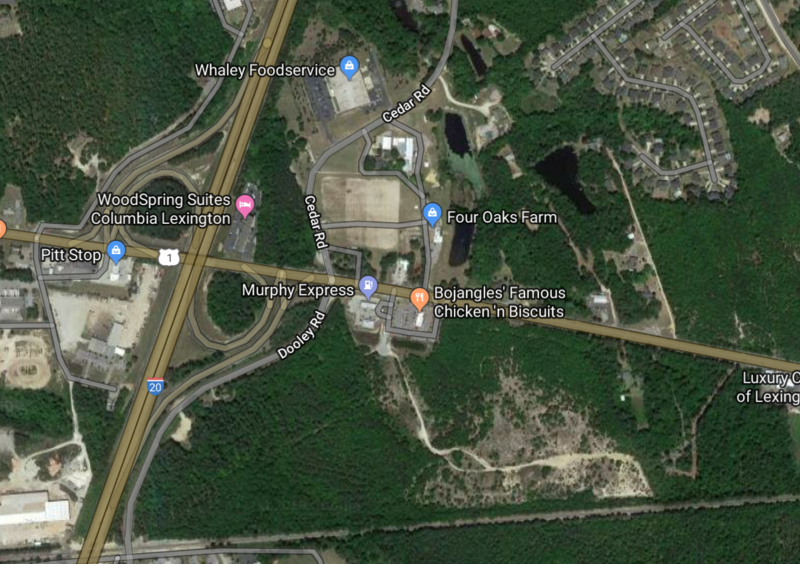 On the 23rd of this month, the Lexington Planning Commission rejected a request to rezone almost 62 acres of land on Rte 1/Augusta Hwy for residential construction. The property, behind Murphy Express and Bojangles, was targeted for over 200 new homes. It was a wise decision by the Commission. The neighborhood would have squeezed hundreds of vehicles through Dooley Road into an intersection that already has two traffic lights only a football field distance from each other. Stopping further development, even on the outskirts of town, is critical to the mitigation of current traffic problems and arresting future ones. With the Town’s prosperity and that to come, the situation will only become worse as long as stores are concentrated along Sunset Blvd. About the only place for new commercial and residential development is west towards Gilbert and Batesburg-Leesville. Hwy 1 has already been widened to four lanes to about three miles from B-L. But will spreading/expanding development really help Lexington? It appears there will be no thinning of the herd and redirection may not be possible for many years to come. Politicians aren’t to blame. Businesses aren’t to blame. Shoppers, tourists and citizens are not to blame. A prosperous community means thriving retail and other commercial enterprises and plenty of customers with cash and credit cards to patronize them. Affluence brings traffic. The better the local economy, the more traffic is generated. No one goes where there is nothing. No one shops where there are no shops, or go out to eat where restaurants ain’t. Yes, it’s inconvenient. Yes, it’s time consuming. Yes, it’s frustrating. At least it ain’t Venezuela. Or Detroit. Posted in Community, Infrastructure, Lexington, RoadsTagged Augusta Highway, intersections, Lexington, Sunset Blvd.